Webpage Optimizer Tools for A to Z SEO Tools - CODELISTPRO | Free Premium Scripts, Plugins, Apps Source Code. 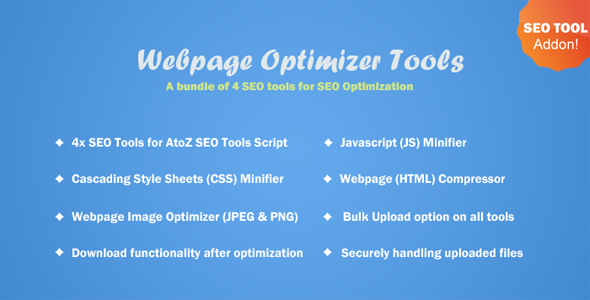 Webpage Optimizer Tools is a bundle of code minifier & image optimizer SEO Tools. This tools helps to optimize your CSS/JS/HTML codes and make your website faster by decreasing the file size. All tools comes with bulk upload and download functionality after optimization.